Did you know that marketing automation contributes to a base of leads that gives a boost of 39% to sales? It is therefore not a surprise as to why the field of Marketing Automation has witnessed a steady growth in the year 2018. Given that the sole purpose of every marketing strategy is to get commercial improvement and earn a better sales figure, you must be ready with a marketing plan for your ecommerce business, so that 2019 becomes the year for you to reach the zenith of commercial success. It is high time you start re-evaluating your marketing strategies and implement ecommerce automation into your core strategies. Ecommerce automation helps you to manage the most complex marketing activities by navigating through multiple channels at the same time. Most marketers these days swear by marketing automation and have nothing but good things to say about it. From better audience targeting to an improvement in customer experience, marketing automation has multiple benefits in store for you. Here are the best marketing automation strategies that can help you boost the sales volume of your company in the coming year. The first step that leads to a better sales margin is the leads. The most proven way to generate leads that can turn into prospective sales is by making your targets realise that you can provide a solution to the problem they are facing. All you need to do is provide useful information, so that they recognize that you are the perfect one to help them with their queries.The content for the webinars must be relatable and should provide a solution. Make sure that the content isn’t teaxt heavy. Make sure to include pictures and graphical representations. By organising webinars, you will be able to generate high-quality leads. You can put them on your website and schedule them automatically, so that new leads are produced in large numbers. You can even try podcasts to give demonstrations that address the problems faced by your target audience. Once you get your hands on the leads, you need to channelize them to bring in more sales. Maintaining good relationships with your leads is the only way out. But, then again, considering how busy we all are, what is the shortcut? “Ecommerce automation will help you to create a chain of automated emails that will be sent to your leads and help you build and nurture your relationships with them. Newsletters and discount are the most common options that you can explore”, says Andrew Hemsworth, marketing strategist for assignment help brand AllEssaywriter.com. There are several tools like GrowBot that will help you identify your prospects and nurture leads to convert them into prospective sales numbers. From the welcome emails to the final emails, automation can help you save both time and efforts. 96% of buyers check out contents that are rich in input. You must create useful and engaging content that serves the queries of your leads.How would you react if I tell you that you can personalise the web content you produce? With marketing automation web management platforms like Duda (which are specifically made to create dynamic and personalized content,) you will be able to engage your leads and urge them to make a purchase. Using these automated tools, you will be able to assess your lead’s browsing history, location and other preferences and create a personalized version of web pages. This will help you to boost the conversion rate and increase your sales margin. If there is anyone who knows your products and services as you do, it is your employees. Since some of them might have been a part of the development process, they should be the best people to promote them. So, make use of their support and ask them to be a part of the core marketing processes. Use the connections of your employees and turn them into brand advocates who can be ambassadors of the vision that motivates you. Tell your employees to talk about your products to create more social engagement and increase your brand’s awareness. Tools like Smarp will allow your employees to discover content related to your company and share them. Marketing automation tools can help you analyse the details of your leads effectively, so that you can use the data to boost your sales. With automated tools at your aid, you will be able to identify purchase patterns and preferences of your customers. Information about their past purchases, lead scores, and old interactions can help you to respond with gestures that will help to build better relationships with them. Automation tools can provide you with vital customised details like pre- and post-purchase activities, engagement details and conversation history. You can use the information to understand your customers.It’s not an easy job to create brand loyalty. But, with personalized data in your hand, you will be able to establish an emotional connection with your customers. If you really want to push your sales numbers, you just cannot focus on new leads. You also need to maintain a good rapport with your old customers, because they are the ones who turn to be the advocates of your brand. So, make use of marketing automation strategies to connect with the old leads. Moreover, since it is more expensive to create new leads, trying to reconnect with your old ones might take it easy on your budget. Remember that your old leads had shown interest in your products in the past. Approach them again and try to find out what made them stop purchasing your products. This will help you to boost your sales by turning the old leads into prospective buyers. Make the most of social media platforms to re-engage with your old leads. Marketing is a dynamic field, the norms of which are changing every day. With digitalization taking over the world, marketing strategies are evolving every minute. To ensure survival in this highly competitive field, it has become all the more important to keep track of the marketing strategies of the year. 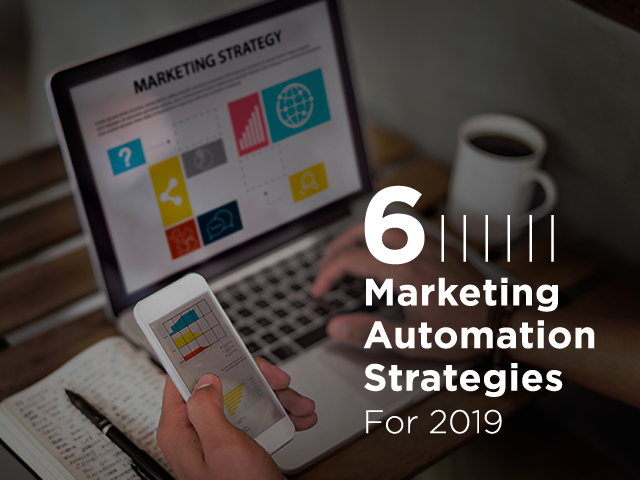 With ecommerce being the most preferred means of business, incorporating marketing automation strategies into your core strategies for the year 2019 will help you face the challenges that the New Year has in store for you. Follow the suggestions listed in this post, and I am sure you will definitely multiply your sales. Do you have other marketing automation strategies in mind? Let us know in the comments below. Alvin Hopkins is a high school teacher from USA who is currently associated with Assignment Help for the past 3 years. He’s also a social activist and has been a part of several social awareness campaigns in the past.